This material is available in 20" (508mm) lengths so clamps can be fabricated in different lengths to suit any requirement. does not include plating or drilled holes. This simple efficient method of clamping workpieces will decrease your set up time and increase your profits and production. Holding force 5845 lb., For use with workholding. Long Length Uniforce® Channel 1000 Wedge, 20"
#62320 Mitee-Bite Long Length Uniforce® Channel 1000 Wedge, 20". 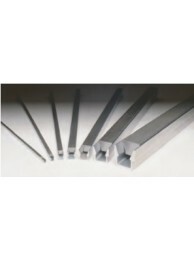 Typically ships in 3-5 da..
Long Length Uniforce® Channel 1500 Wedge, 20"
#62420 Mitee-Bite Long Length Uniforce® Channel 1500 Wedge, 20". Typically ships in 3-5 da..
Long Length Uniforce® Channel 2000 Wedge, 20"
#62520 Mitee-Bite Long Length Uniforce® Channel 2000 Wedge, 20". Typically ships in 3-5 da..
Long Length Uniforce® Channel 250 Wedge, 20"
#62010 Mitee-Bite Long Length Uniforce® Channel 250 Wedge, 20". Typically ships in 3-5 days, fo..
Long Length Uniforce® Channel 375 Wedge, 20"
#62020 Mitee-Bite Long Length Uniforce® Channel 375 Wedge, 20". Typically ships in 3-5 day..
Long Length Uniforce® Channel 500 Wedge, 20"
#62120 Mitee-Bite Long Length Uniforce® Channel 500 Wedge, 20". Typically ships in 3-5 day..
Long Length Uniforce® Channel 750 Wedge, 20"
#62220 Mitee-Bite Long Length Uniforce® Channel 750 Wedge, 20". Typically ships in 3-5 day..
Long Length Uniforce® Slug 1000 Wedge, 20"
#63320 Mitee-Bite Long Length Uniforce® Slug 1000 Wedge, 20". Typically ships in 3-5 ..
Long Length Uniforce® Slug 1500 Wedge, 20"
#63420 Mitee-Bite Long Length Uniforce® Slug 1500 Wedge, 20". Typically ships in 3-5 ..
Long Length Uniforce® Slug 2000 Wedge, 20"
#63520 Mitee-Bite Long Length Uniforce® Slug 2000 Wedge, 20". Typically ships in 3-5 ..
Long Length Uniforce® Slug 250 Wedge, 20"
#63010 Mitee-Bite Long Length Uniforce® Slug 250 Wedge, 20". Typically ships in 3-5 days, ..
Long Length Uniforce® Slug 375 Wedge, 20"
#63020 Mitee-Bite Long Length Uniforce® Slug 375 Wedge, 20". Typically ships in 3-5 d..
Long Length Uniforce® Slug 500 Wedge, 20"
#63120 Mitee-Bite Long Length Uniforce® Slug 500 Wedge, 20". Typically ships in 3-5 d..
Long Length Uniforce® Slug 750 Wedge, 20"
#63220 Mitee-Bite Long Length Uniforce® Slug 750 Wedge, 20". Typically ships in 3-5 d..